Recently a powerful revelation came to me. I have comprehended a truth which has entirely changed my outlook on life. The blinding simplicity of it still shocks me. How I could have lived as long as I have, experienced all that I have and never opened myself up to the simple elegant reality I will never know. All that I do know is that I repent my ignorance absolutely and declare with joy and conviction that I have seen the light. I accept in my heart that 2+2=5!! I know that some of you will have trouble accepting this wonderful truth. I myself struggled with it, blinded as I was by my closed mind and the limiting constraints of “reason” and “evidence” but I have come to see that we do not need to be tied by the narrow “scientific” perception of mathematics. We can choose to accept alternative arithmetical systems and free ourselves from the crushing yoke of rational testable procedure and universal numerical consensus. After a lifetime of casting about for meaning and understanding I know in my heart that I have finally found a truth worth committing myself to, and you can share in it’s glory as well! My faith that 2+2=5 gives me the strength to face the day. It helps me through those hard times and shows me that anything is possible with enough faith. It makes me want to be a better person, and to help my fellow human beings see that they too can know the joys of Intuitive Calculation. It is the inspiration for my charity work and in time it will be the tradition of my family. Who do my beliefs hurt? Why shouldn’t I be allowed to think what I like regarding “mathematical truth”? What right does anyone have to tell me that 2+2 does not in fact equal 5?! I say they have no right at all! I ask those of you who are open to the Fivist Truth to gather with me in the community of Numerical Intuition, and I call the non-believers who are open-minded and respectful of the beliefs of others to lend me your support. Please, write your representatives, speak up for the rights of Fivers like me and help me to make a more balanced and inclusive example in our schools. Why should my children, or any of our children, have to learn the lies of the “Fourers” exclusively? Is there not room for a more enlightened, broader understanding of Numeric Truth? Why shouldn’t all children be exposed to the debate? I demand that my point of view be granted equal weight with the competing numerical theory, after all it is just that a theory. I am sure that some of you out there will want to deny my revelation. 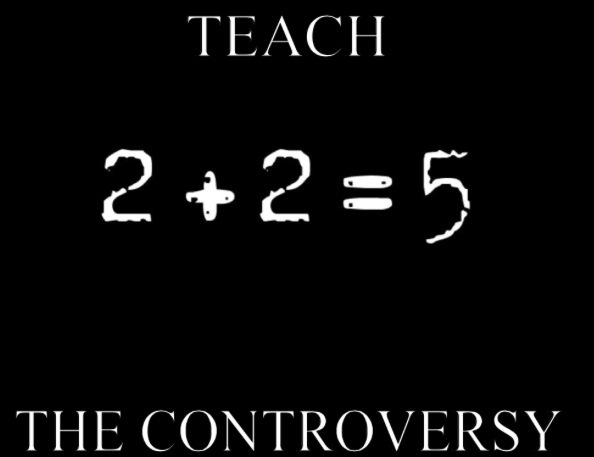 You’ll be quick to judge my truth by your limited understanding, maybe even going so far as to arrogantly toss up “equations” and “proofs” as though your “evidence” is somehow more valid than the feeling of warmth and meaning that the Truth of 2+2=5 gives me. Well, I do not want to live in a world where 2+2 must equal 4! How can anyone cope with such a coldly deterministic reality? Know now that I will not be misled again! What arrogance you Fourists and your pet “scientists” display! After all science is forever changing, discovering new truths and amending outdated ideas. It is not as if you actually know anything at all! In time it may be discovered that in fact 2+2 does equal 5, and because the possibility exists, no matter how unlikely that possibility may be we must accept it as Truth, to do anything other is to be far too narrow minded and rigid in our thinking! Please consider the Truth of 2+2=5, feel the joy of conviction freedfrom the shackles of basis and let go o f your biased “logical” prejudices. Count not with your fingers, count with your heart.